Enjoy 7,000 + acres of prime pheasant hunting habitat. At Rooster Ridge, we spend the off-season preparing the critical pheasant habitat so when you arrive, the birds are where they need to be. 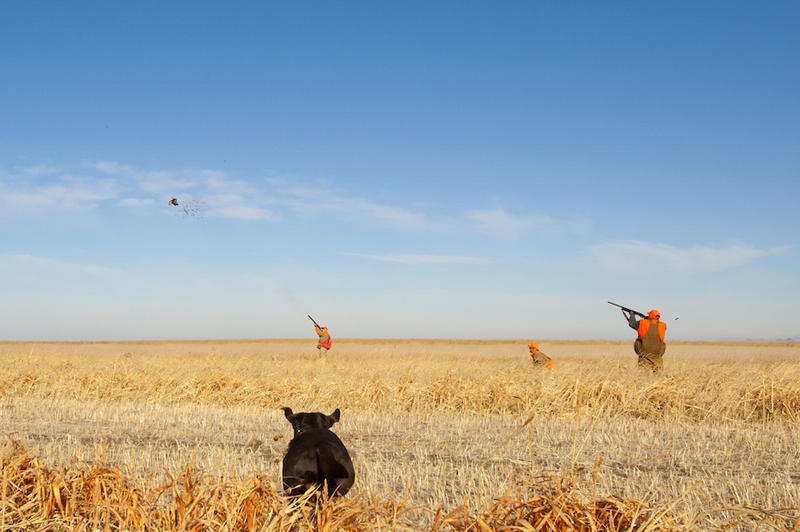 As any hunter knows, South Dakota is the all about pheasant hunting and offers some of the best hunting in the United States. We make sure that every acre of habitat is manicured to offer prime pheasant hunting. When you come and hunt with us at Rooster Ridge you will enjoy a pristine lodge exclusively for your group and possibly a few other hunters but you will not be mixed with other groups in the field. Pheasant hunting is that much better when you have wide open spaces to enjoy! You will find some of the best guides, dogs and habitat when you hunt with us. Warm up for the pheasant hunt on the clay pigeon range before heading to the field for an exhilarating day of Hunting. Every guide will focus on you and your group and making your experience in the field the best it can be. When you return to the lodge, head up the clubhouse and enjoy the spectacular view of the Missouri River or just kick back and watch the game on one of the satellite televisions. Staying with us at Rooster Ridge is all about the hunting and quality relaxation time for you and your group.